Justin A. Cohn | The Journal Gazette Komets captain Jamie Schaafsma has played in seven finals and won four titles. He thinks the early struggles the team went through has made the players stronger heading into their playoff series opener tonight against the Toledo Walleye. No one at Memorial Coliseum would deny it's been a trying season for the Komets. They didn't get off to a very good start, made 11 trades, brought back popular players Shawn Szydlowski, Mason Baptista and Craig Cescon from Europe, yet struggled with inconsistent efforts, turnovers and penalties into the penultimate week of the season. But captain and team MVP Jamie Schaafsma, who has been to seven playoff finals and won four championships, believes the Komets' struggles will make them a formidable foe. “When you go through those struggles and adversity during the year, I think it makes you a stronger team and I think our bond together as a team has grown over the last month or so,” said Schaafsma, whose Komets open the best-of-7 Central Division semifinals 7:30 p.m. today against the rival Toledo Walleye at the Huntington Center in Toledo. 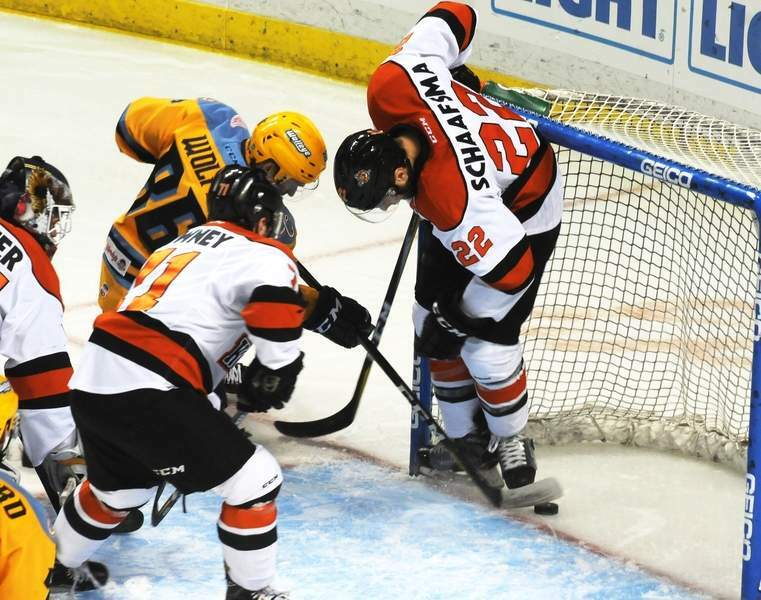 The Komets ousted Toledo 4-2 in the Central Division finals last year, a monkey off the back of a Fort Wayne team that had lost two previous series to the Walleye. The Komets (36-26-10) have eight players (Schaafsma, Szydlowski, Baptista, Marco Roy, Anthony Petruzzelli, Phelix Martineau, Cody Sol and Ryan Lowney) back from last year's series with the Walleye (40-23-9), which has six players back (Shane Bershbach, Dylan Sadowy, A.J. Jenks, Kevin Tansey, Ryan Obuchowski and Pat Nagle). While Toledo went bigger and more physical with its roster after last year, and Fort Wayne is smaller and faster, the regular-season series was still closely matched, except for the Walleye's 11-0 victory March 2. The Komets went 5-4-2 and there were seven one-goal games. “They're a team that we've had some back and forth with this year, but we've had some success as well,” Schaafsma said. “I think we're confident that we can beat them. (Our) team isn't overconfident, though, it's just that we've got to find a way to be consistent. This season, we've had our inconsistent moments. Toledo has home-ice advantage, but both teams are 5-4-1 over their last 10 games. Toledo has seven players contracted to either the NHL's Detroit Red Wings or American Hockey League's Grand Rapids Griffins, where defenseman Trevor Hamilton remained Thursday. The Komets' playoff roster has three players on higher-level contracts – goalie Zach Fucale, forward Martineau and forward Matthew Weis. Martineau should return after Laval's season ends Saturday, but there's no telling when Weis could come back from the Chicago Wolves. “We're not a team that's going to get a lot of reinforcements from anywhere. We have what we have, but I think we have some good pieces and we're getting healthier,” said Graham, who could have Cescon and Sean Flanagan back from injuries today. Note: Cincinnati's Michael Houser was selected ECHL Goaltender of the Year, a season after he played with Fort Wayne. Idaho's Tomas Sholl was second and another former Komet, Sean Bonar, of Atlanta was second.